Carlin Weinhauer spent the past 10 years with MB Mission; this picture is from their memorial video. 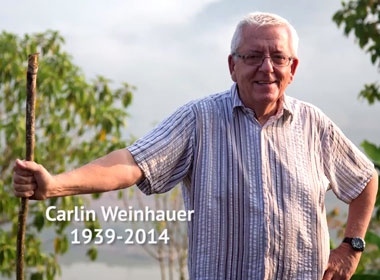 Carlin Weinhauer passed away April 19, following a short but intense battle with cancer. Best known for his 20 years as pastor at Willingdon Church in Burnaby, Carlin was not originally from this area and his influence was certainly not confined to the west coast. Thus it is probably not odd that the only time I actually met Carlin was when I shared breakfast with him in Moscow during a conference focused on the North Caucasus – even though I had read and written about him for years, and occasionally saw him up on stage at one his church’s events. This was toward the end of Carlin’s time at Willingdon, not too long before he began working with MB Mission. He made many trips overseas before, during and after his years at Willingdon. Following is a brief excerpt from his wife Marcia’s eulogy, starting with their time at Willingdon; for the full text go here. “God moved Carlin and Marcia once again to congregational ministry upon invitation to serve on the pastoral team at Willingdon Church in August 1984, where they served with joy for just over 20 years. During the years at Willingdon they visited a number of countries in Asia, Africa and eastern Europe on short-term mission trips. The church planted a church among the Chechen people in 1997. “As a young person, Carlin spent time poring over the pages of the National Geographic magazine having, early on, a deep interest in geography and travel. God prepared and blessed his life with opportunities to minister far and wide in many countries, even to brief teaching opportunities in China. “Carlin has had a great love for the church and a deep desire to see young pastors preach through the Word. In December 2004, Carlin retired from pastoral ministry at Willingdon and was invited to join the lead team of MB Mission, January 2005, serving in mobilization and media. Since then, Carlin has led teams of people to MB [Mennonite Brethren] mission fields, primarily Thailand, along with Brazil, Burkina Faso and India. He has served with joy, deeply loving God’s work far and wide. Randy Friesen, general director of MB Mission, said, “Our mission family has been deeply impacted by Carlin over the past 10 years that he served with us . . . There will be a memorial service for Carlin Weinhauer at Willingdon Church, Saturday, May 3, 10 am. It is with deep sadness to hear of Carlin’s passing .we will miss him and his visits to Sask. May Gods comfort and peace be with you . I was carrying you around in my thoughts today, wondering if you had heard of Carlin’s passing yet, and thinking I must write you. Then I found you here! Carlin loved you, as I do. Blessings on you as you carry on in your special ministry of loving and caring for people. We remember Carlin with his extraordinary talent in leadership. He had a gift of inspiring others Although we have not seen you since BBI we heard about your ministry with the MB’s. Praying that you will always cherish your memories as you move forward in serving Jesus.